This is a training camp so focus and remove all distractions. To get started with the training, you have two options. Part 2: What is PLR? Part 3: What is the difference between PLR/MRR/RR? Note: Version 1 of CoverActionPro has been discontinued. You will need to use out Smart eCovers templates. BlueHost – In case you don’t have web hosting yet, I recommend BlueHost. They offer a free domain registration for your first year. NameCheap – If you don’t have your own domain name yet (yourdomain.com), register with NameCheap. JVZoo.com – platform for managing all your digital products. In order to sell products using JVZoo, make sure your PayPal account is either a Business or Premier account. You can convert your personal PayPal account to Business/Premier free. FileZilla – FTP software for uploading files to your web host. 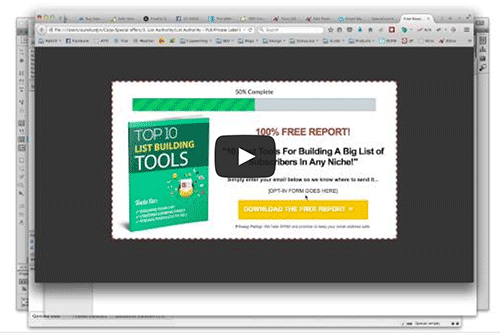 Jing – another screenshot tool. SnagIt – another screenshot tool. Kompozer – A free alternate to Dreamweaver. Cover Action Pro – eCover action scripts for Photoshop to create eCovers. Well worth the investment. AWeber – Autoresponder service that I recommend. GetResponse – Another autoresponder service that I recommend. AdsVantage – This is a Facebook Ads course I created. If you’d like to learn how to get started, get this course. Udimi – Buy solo ads. Clickonomy – Another site to buy solo ads. ClickDrop – Another solo ad service. Warrior Forum – The leading internet marketing forum. Make sure your download page and any access links work 100%. Make sure you include a support email or URL on your download/’Thank You’ page. What I didn’t explain in too much details is which files do you provide to your customers? Watch this video. Need help? Want to leave a comment? Has this training helped you? Do you want to see more? Simply leave your comment below in the Comments box. I’d love to hear from you! Thanks for the great training Aurelius. You really offer a lot of value to your customers and subscribers. Keep up the great work! Thanks Kenny. Glad you found it helpful! Yes, FileZilla for uploading the files is what we use. this training camp was an eye opener, this is the stuff I have been waiting to learn to put in motion my plrs and do the work myself. thanks for your work and patience for putting this together for us your clients. thanks again. Glad it all helped, Anthony. You have grown since you have joined! 1) Is FileZilla still the only way to import the *.html files over into wordpress, or is there another new & faster way to import them over? 2). When I used Kompozer to edit the sales & lead magnet pages, it saves them as xhtml pages rather than html pages. Is this how they are supposed to be saved? Not sure if this is the proper place to post this information, so if it is not, please let me know…. Hi Rose. This is definitely the place to post questions like yours so that others may be asking the same questions. Things are still done the same way, at least with my packages. 1) FileZilla is one of the more popular FTP tools to upload files from your computer to your web host. It’s not for WordPress. WordPress has its own theme. 2) In Kompozer, you can go to File > Save As and make sure it is saved as a .html file. I’m just seeing your website for the first time time and i’m already excited, for this seems to be what i’m searching for, can’t wait to watch. But looking at details above i’m still wondering if this can really help someone my background in this industry: I’m newbie and know nothing about website design…even terms like FTP sound strange to me. I love learning, and like doing things myself and mastering new skills, but i’m wondering if this your training is for someone like me who doesn’t even no the basic things about wordpress. I’m actually looking for training that would guide me through the basics. Though i have bought someone PLR products, I don’t even know what to do with them. The PLR Training Camp goes through every single details, including everything you mentioned, so rest assured! Take it one step at a time and you’ll get there! 2). I could not find a way to automatically send an email to the purchaser with download instructions. Is there a better solution to integrate the payment processor to my sales page, or is there a comprehensive software interface that can do all this more seamlessly? Hi Rose. That’s awesome news! I’m so glad to see you’ve taken action! I would recommend using JVZoo to handle product delivery. It’s from 42 minutes 9 seconds. That will show you step-by-step how to add a JVZoo order button. It integrates with PayPal. Make sure your PayPal account is upgrade to either Business or Premier status. Thank you for pointing me in the right direction. I’ve implemented the payment method through JVZoo and have followed the steps you describe in the video. However, I’m running a “Test Purchase”, and it’s not processing my payment. I’m getting a JVZoo msg after the Paypal payment is made that says that the payment can’t be completed. Is there another piece that I’m missing in the product setup? Am I supposed to fill out the “External Program Integration” section with JVZoo’s IPN # into my Paypal’s acct? Not sure where else to look or what could be preventing the sale? Great to hear you’re another step closer! Have you checked to make sure your PayPal account is Premier or Business status? If not, you can upgrade for free. Otherwise, I would recommend you contact JVZoo customer support about the error message you are getting. The external program integration is only needed if you’re integrating third-part scripts or software such as membership scripts. Thank you for all your help. I was able to successfully setup my first (ever) product on JVZoo!! Your videos were so instrumental & helpful in learning how to implement this in an easy step by step way. I am now setting up the Gold Pk (upsell) videos, but I’m wondering how to list various items (videos) on the “download- thank you” page. I didn’t see a pre-made download page listing all the videos, so can you let me know what the process is to list them all on the download page? Hi Rose. In regards to your question below, I have emailed you directly due to WordPress not allowing any more sub-comments. No website yet. Watched training it motivated me. When I get a website do I register it on my name, or do I need to create a business name? Can the hosting be from the same company as where I registered from? First time looking at marketing something I bought your package. I am unemployed and think this is the best way for me to start generating income. I’m also considering for you to set it up for me as I don’t have the skills and I need to generate an income soon. I can go fhrough the training again and again until I get it. Hi Paul. You can register any domain you like. The easiest is to register your own name. Otherwise, you can register a business name such as ebookstore.com or ebookkingdom.com. You get the idea. Hello Aurelius. I would also like the information you emailed Rose regarding setting up the Gold package. Hi John. I simply advised Rose to upload the videos via YouTube using “Unlisted” preferences so that only those with the link can view the videos. You can also embed the videos directly onto your access page so customers may view. I have been trying to use compozer when the application open up i see the picture for a second, then it disapears but in the browser part you see something in the window. what could be the problem, trying to learn your process. It is most likely a linking issue with your images. I would suggest going through the video slowly and follow the steps. I have been trying to use compozer when the application open up i see the picture for a second, then it disapears but in the browser part you see something in the window. what could be the problem, trying to learn your process. what is the best appli. to open mac docx? Hi, I really love this video and how you touched on everything that needs to be done. I have a question though, do we really have to use Aweber and Get Response at the same time or can we just use one for now? I’m new to this and I am on a tight budget being unemployed for a long while with no income can be frustrating. I have a domain name and a hosting too, but do I really need an actual website like installing a wordpress or can I just use the hosting and domain name and the auto-response will take care of the rest? I hope to hear back from you asap. You absolutely don’t need both AWeber and GetResponse. Pick one. Personally, I use GetResponse more as most of my list is in there now. Aweber is just as good. If you have a domain and web hosting, great! That is all you need. 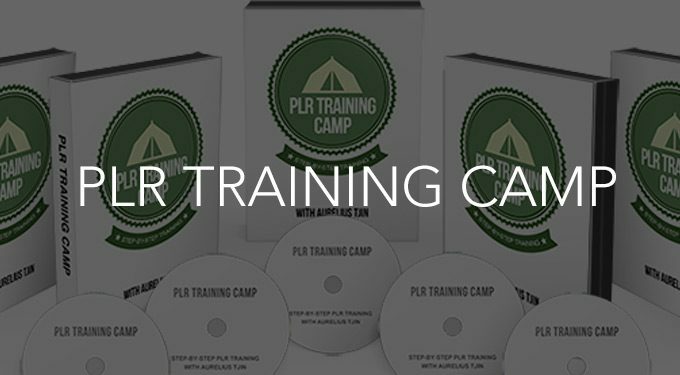 Simply follow the training video to install your PLR product. You know something Mr. Tjin you’re awesome man. I really appreciate the fact you got back to me in a timely manner and that shows you’re real and your professionalism… There was two more question I forgot to ask you or mentioned and one you forgot to answer but it’s cool. First question is can I sell this on Kindle and Barnes & Noble? Second question I’d forgot to asked but I think you probably forgot to answer it but we’re only human right and that’s cool. Do I need to install a word-press or the domain name and auto responder is going to take care of all my business needs? Well I hope to hear back from you asap. Yes, you may sell it on Kindle and other sites. You only need to use WordPress if you plan on using it as a platform for running a blog or even landing pages. 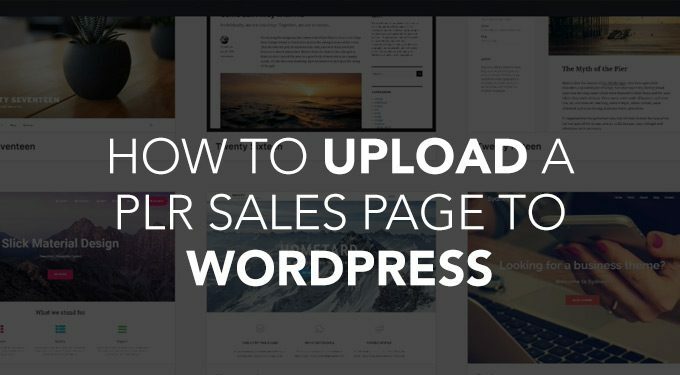 I recommend using OptimizePress to create landing pages – https://unstoppableprofits.com/optimizepress (affiliate link). It might be a bit pricey but it’s definitely worth the investment as you can create sales pages, membership pages and opt-in pages. You could do without OptimizePress and simply install WordPress on your domain and then integrate an autoresponder so that you can build your list. OptimizePress I can’t afford it and I don’t have the money at all. So I will use install WordPress to my domain name and then integrate an autoresponder which is best for me right now. Hi, I was going through the ebook with you in the video and it seems like something is missing in page ten and 21 or 27 I believe. It’s a blank page. How can fix that problems because I didn’t edit anything from those pages. Which product has these missing pages? Well I hope to hear back from you ASAP. It’s page 10 and 21 or 27. I’m having a bit of an issue Mr. Tjin. I’m trying to convert the eBook PDF to a word doc from PDF but it will not let me do that. I want to sell it on kindle and other plat forms, but don’t know if I should customize it or not. Also if I do customized it how do I put the authors name in it which is me there? Lastly, should I upload this book in PDF or a Word doc or it doesn’t even matter? Looking forward to learn more from you on how we can further get traffic to our product pages. Great! In the video, I did share some traffic tactics. Rasool – They are not missing, they are page breaks for the next chapter. You don’t convert the PDF, you convert the Word DOC to a PDF. You can put the author name either on the first page by simply typing on it or just enter it in on the second page. You will need to upload the PDF, not Word Doc. Uploading the Word Doc is prohibited as it it the source file. You may contact me via the help desk at https://unstoppablehelp.com if you have any further questions. Just put a note that it’s for Aurelius Tjin. Plus the learningskurv you provid to us custommers..
Hi Sylvia. That is a good idea. I will see if I can have that prepared. Looks like it will be another busy day for all of you. I second the idea that Sylvia brought up about having training available in PDF format. It would help me a great deal. Since I have a bad case of PTSD and a brain injury, they are not the same thing, from serving with the reserves in the Middle East and a major truck accident. By following along with a written copy of what is on the video would help my brain retain the material quicker. As we say in the artillery “things happen” and the key is to work at overcoming the issue. I had a number of successful businesses before the accident and have bought your product and will set up a business. Having done research this is one of the few ways to make the same income I was making previously. Looking forward to helping you be a greater success and in doing so I will become a success also. A further question which of your two names is your family name so I can address you properly. I know some people have westernized their name and have their family name last and others prefer their cultural norm and have the family name first. Sorry for the spelling but I could not find a spell checker. Am I looking in the wrong place or does it not exist. Hi, and thanks for your feedback and sharing your story with us. A PDF version of this course would definitely be helpful as an additional learning aid. I have it on my to-do list and will find a suitable transcriber. When it is ready, I will have it available on this page. Just watching your support efforts right here today is astounding! I have constantly bought other peoples’ products in the last two years while/since recovering from a cerebral stroke which wiped most of my active memory – 20 years of Internet knowledge simply vanished for the most part . THIS one is a great product, great presentation, great support! it’s the wasted hundreds of hours trying them out! I’ll have this one up and going shortly – and I’ll be back for your other products , too. I’ll save hundreds of hours looking at all the other offers out there. Hi and thanks a lot for your thorough feedback! It means a lot to me. I’m sorry to hear about your past incident but glad you’re back at it and continuing to learn internet marketing. I remember something that your team may set this all up for me for $197, is that still valid? Though I have looked at this many times, I am still lost. Things are not connecting in my head. Please help? Yes, we offer installation service. I have a question. You mention about setting up A membership site using WP. How do you control the customers who don’t renew their subscription so that they can be removed from the autoresponder sequence? Hi Bruce. That’s the only part that’s kind of a drawback. You would do it manually. When you get the cancellation email from PayPal about a customer’s cancellation, you simply search that email in your autoresponder and then remove them. Usually I have an extra field when members sign up where I ask them for their PayPal email, since their PayPal email might be different to their main email. That way, you’ll have two emails you can search for in your autoresponder to cancel the member. Hello my guru friend, well i have some 33 of your product on jvzoo thanks my friend, little by little i have been learning you processing system. hoping to start earning money from my efforts. have a great day. thanks. Not sure how I started out buying a Video Maker Pro and ran across all this incredible content, but sure glad I did. Your helpful knowledge has been an answer in disguise. Again Thanks my man! Would you be open to an Interview at some point, and maybe allowing me to review some these awesome products for my Video Show? I’m not taking any interviews at the moment unfortunately. But you’re more than welcome to create video reviews! Hi Keith. It doesn’t make a different which files you upload first. As long as they are all uploaded, they should load. And be aware of the file and folder names as it will be case-sensitive. Ftp is something very hard to understand. Yes, FTP can be a little tricky to understand but all it is is a tool to upload your website files to your web host. If you’ve uploaded to the right directory then you should be able to view your website by entering the URL in your browser. If you don’t want to use an FTP software, you could login to your web hosting control panel and finding its tool for managing your website files. If you have a cPanel enabled control panel for your web hosting then find a tool called ‘File Manager’. You may then upload that way. Usually you would upload to your ‘public_html’ folder.